Before we left California, I stole something. And by “stole” I mean I announced to Mama Syd that I liked a particular item and would like it for the baby. She assured me my brother wouldn’t mind. Maybe stealing is too harsh a term for whatever offense it is that I made . . . I never really knew my Nana Mickey’s mother. 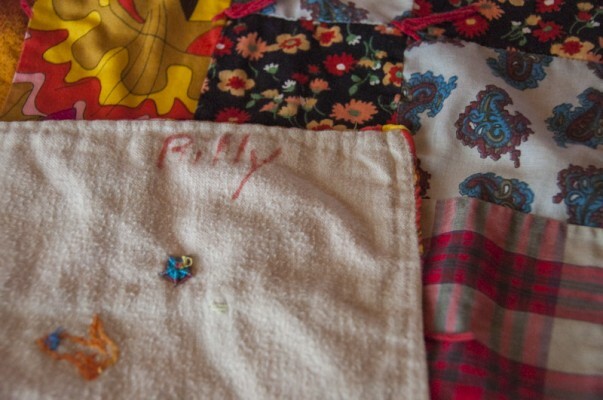 I met her a few times, saw us together in pictures and owned doll-size quilts she made for us. 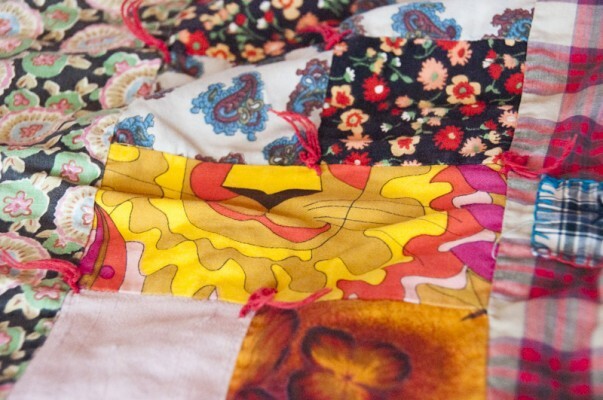 Those quilts were the greatest connection I felt to her. Garrish and loud with uneven edges, they were well played with but not particularly beloved. Then I grew up and became a mother. I learned some more about Grandma Ruby and life and the few things I have of her I treasure. 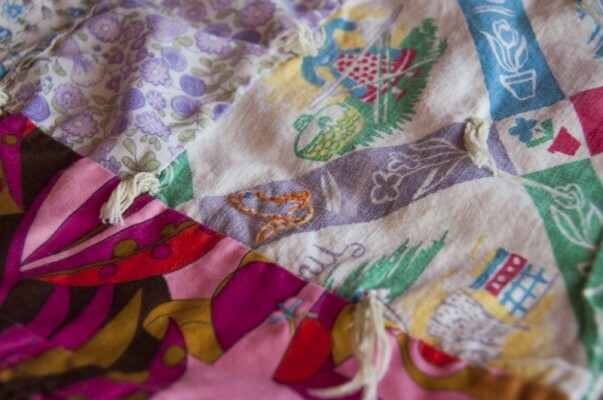 Then I lost my own grandmother and suddenly the love and thought that went into those quilts, the memories they hold, well, they were very important. 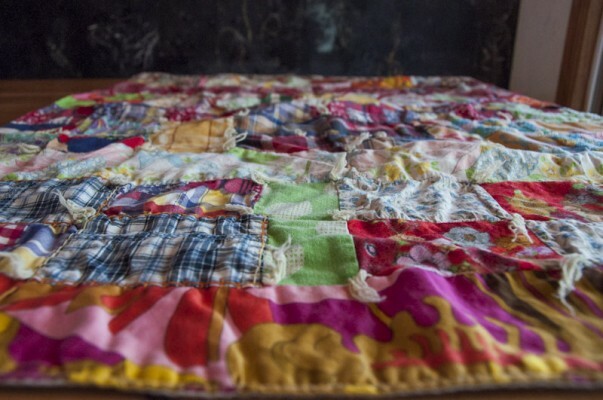 This quilt I claimed for Sixtus, I don’t remember being around. It’s larger than a doll’s blanket and has Grandma Ruby’s record on the back. 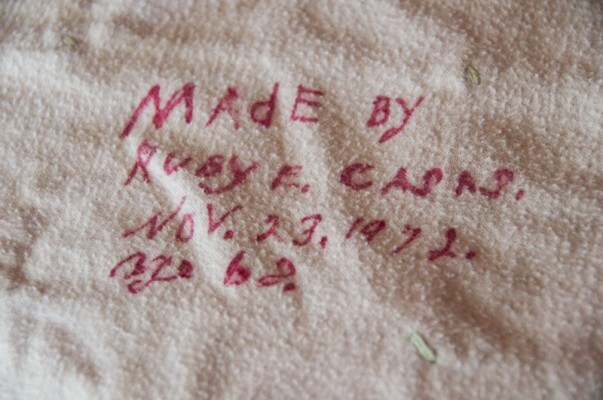 It says it was made in 1972 though my brother wasn’t born until 1982. Maybe she had a stock pile? The loud, dated colors that didn’t impress me as a kid are just right to me now. 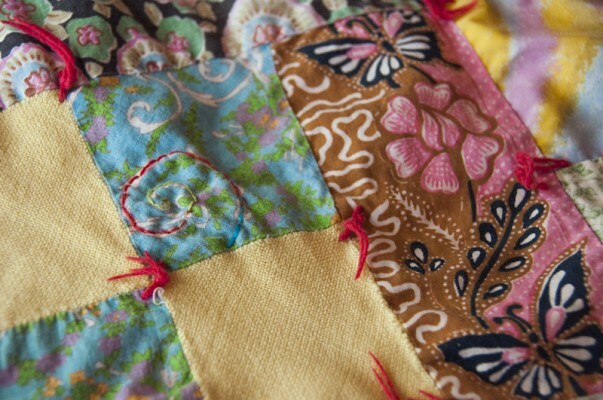 I love that the pieces are real live scraps and patches. I dig the terry towels printed with flowers used near the plaid. There are silks and flannels and all sorts of polyesters. My favorite piece is the nose of a golden lion. Just the nose and whiskers. Awesome. It was a little worse for wear. It’s 41 years old if the date is right. The quilt needed a little TLC to be sure. I set about embroidering over seams. This evolved into cutting out frayed pieces (just 3!) and patching over the blank spaces. I loved adding my touches to a piece my great-grandmother made but even better was when the girls asked if they could help. Yes, they were eager and sometimes impatient, but they were serious and overjoyed to be making something for Sixtus. We talked about Grandma Ruby and Nana Mickey while they worked. This piece, this simple blanket for a sibling they don’t know yet already loved, was made by their great-great-grandmother. They don’t know her either but I’m pretty sure that while sewing on her quilt, they came to love her, too. Tess outlined a cat on the patch with the Dutch woman. Ellie chose to embroider a “swirl” on a floral piece. They both searched out any holes that needed to be covered and picked out the thread for the spiderwebs I stitched over them. When we were done, we washed the blanket and held our breath. We all oohed an ahhed when it came out softer and just a little brighter than when it had gone in. Now it sits patiently in the Suburban with the car seat, waiting for baby’s ride home. “Do you think Sixtus will like it?” Ellie was anxious to know. I assured her I think he’ll love it as much a we all do. “What piece will be his favorite?” she wondered. Only time will tell, but I hope when this child can understand he will love the whole of it and the memory of the woman who made it, too. I am so glad you and the girls worked on this together. So awesome to think it is their great-great grandmother that sewed it!